Gameboy Development Forum / Gameboy MBC3 capacitor/crystal values? » Gameboy MBC3 capacitor/crystal values? I have made a flash cartridge using an MBC3 chip, and everything works except for the oscillator circuit. I am using a 12.5 pF oscillator and two 15 pF loading capacitors. I am also using a series resistor of 330K ohms. They are arranged similarly to an original cart: trace runs from MBC through resistor, then C1, then through oscillator and back through C2. The circuit worked on my breadboard but not on my pcb. Any suggestions? I can provide more info as needed. Re: Gameboy MBC3 capacitor/crystal values? XIN is pin 19 and XOUT is pin 20 of the MBC3 and you cannot switch them. 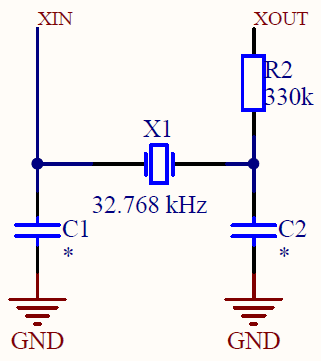 The resistor is important to hit the right frequency. Using a 12.5 pF crystal, I estimated CS to be 5 pF, which is just a blind guess. This resulted in C1, C2 = 15 pF, but I am not getting any oscillations. Could it be an issue with my trace size? My trace width is .17 mm. Honestly, it could be bad luck, but I would expect some oscillation in that case. I usually just go with 22pF for MHz range oscillators and never noticed any issue. Personally I find 5 pF stray capacitance a pretty high assumption, but it depends on the PCB, the chip process etc. In general I also find capacitor selection hard and usually try to adhere to device manufacturers' recommendations. Some farfetched things I can think of is that the MBC3 has a weird pin that is only ever described as #WP (write protect?). It is usually connected to a high-active CS from the backup battery IC. There is also the PHI pin that is connected to the edge connector. I could imagine this somehow influencing the clock circuit, because it is supposedly used for synchronizing the clock registers. EDIT: How do you actually know the crystal isn't oscillating? You aren't measuring with a regular oscilloscope probe, are you? I assumed the MBC wasn't malfunctioning, because I could play games just fine, so I just assumed it was an issue with the oscillator. After soaking the board in alcohol, scrubbing, rinsing, and drying, the oscillator seems to be working great. My guess is that I missed some flux that was interfering somehow? It really surprised me when it started working. result in a loss of program control.